Everybody with a Student Pass is welcome: whether you are a well-advanced player or whether you have never played before ! You can either go for a tennis clinic for beginners or join a mini tournament from 16:00 till 17:30. We welcome all students who enjoy playing tennis. We have a special and favourable membership for students. EUR 100 is the annual membership fee for students for which you can play 365 days all year long. There is a one off registration fee of EUR 25 and a yearly KNLTB contribution of EUR 17,13. We have 14 courts all with light; of which 6 are all weather courts and 8 clay courts. We organise various tennis and social events for students. Please look at the "Activiteiten Agenda" on this website for all activities and dates. If you are interested in having tennis lessons please contact our main trainer Bas van der valk Bas@burgersdijktennis.nl . He will be able to help you find the best training you are looking for. If you are interested in playing competition: also please contact Bas. We have different forms of competition; for beginners till professional players. You can also join us with your own team or we can add you to a nice team at your level. We have a special offer for Students having the "Sports & Fitness Pass "of THUAS (De Haagse Hoge School). This pass can be bought by THUAS (The Hague University of Applied Sciences) or 'De Haagse Hoge School" at the Sport Campus. For more info please mail to: campus@hhs.nl. 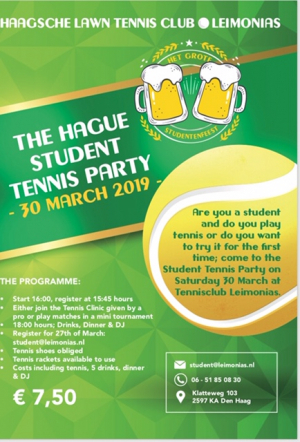 With the Sports & Fitness Pass you are allowed to play tennis at our club by showing your Pass to the people at the bar and to pay EUR 5 for that day including a free drink at the bar. You are welcome to play all year long; 365 days during the day and evenings. With the Sports & Fitness Pass you are also allowed to join the Student Tennis Clinics from 20:00 till 21:00 hours each Monday and Thursday as of 1st of April till summer at Leimonias. The clinics will be given by a fully licensed trainer of our Burgersdijk Tennis school. You can join max 5 tennis clinics for free. After the 5 free clinics you are welcome to keep joining by paying EUR 5 each time, which is including 1drink at the bar. Please show your Sport & Fitness Pass to the bar people and you will be able to pay and get a free drink. 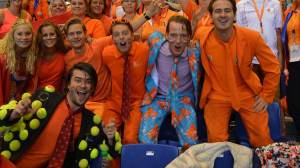 For more info : www.thehagueuniversity.com/sports and www.dehaasgehogeschool.nl/sport.